It’s a Mobile World! Are you prepared? By definition, a smartphone is any mobile device that combines functions such as telephone, e-mail, Internet access, contact information, and calendar. 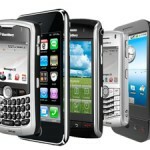 The three major suppliers of smartphones are Apple’s I-Phone, RIM’s Blackberry, and Google’s Android. Here are the facts about the growth of the smartphone market.